Giving Hope Lawn Management is proud to serve the community of Atlee with professional lawn care and landscaping services. For more information or to get a free quote call us today at 804-839-8340. 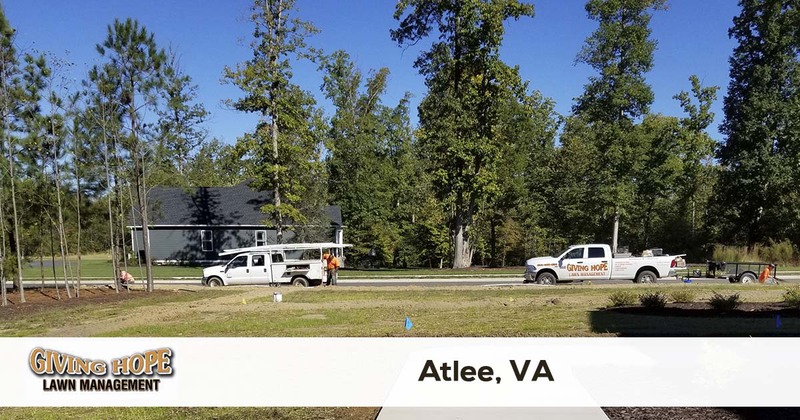 The community of Atlee, VA, remains an exciting town born out of the railroad industry. And considering how easy it is to hop on the highway and get to Richmond, it’s no wonder so many love living here! But one thing that still doesn’t feel simple is locating an Atlee lawn care that you can trust. Whether you find an unreliable service provider or they charge too much, hiring someone for your landscaping is a hassle! But when you hire Giving Hope Lawn Management for your home or business, we help you save more on complete lawn care services. From monthly lawn mowing to irrigation systems and yard drains, we do it all at lower pricing! If you no longer want to settle on lackluster landscaping options, then call the team more residents trust. We’ve helped grow better lawns in the area since 2011! What makes us the best company for your yards is that we merely offer more services at lower rates. Whether you’re planning an entire yard renovation, retaining wall construction, or just need monthly lawn maintenance, we offer affordable prices and fast results each time. Don’t allow just anyone to service your yards. Instead, hire the team that helps more businesses and homes look their best every month! Call today for all your landscaping service needs. We keep your lawns healthy from the ground-up! For the best choice in local lawn care professionals, you can always depend on our team. Call now for the best in affordable landscaping solutions! Giving Hope Lawn Management is the industry leader for lawn care and landscaping in Atlee. We offer a 100% satisfaction guarantee with all of our services, so there is no risk for you to give us a try. Give us a call today for the fastest service at 804-839-8340.